TRICHOTECH ® WP contains spores of Trichoderma asperellum an antagonistic fungus that is used globally for control of soil borne fungal diseases including Fusarium spp., Rhizoctonia spp., Sclerotinia spp., and Pythium spp. In addition, this strain is known to have the ability to increase plant growth vigour. TRICHOTECH ® WP formulation contains spores and mycelial fragments of Trichoderma asperellum Isolate H22 at a concentration of 4 x 109 CFUs per gram. microbes providing a barrier to combat disease-causing fungi. The fungus has a saprophytic activity. It produces gas, which inhibits stages of the development of phytopathogenic fungi. Trichoderma has the property of stimulating plant growth. The fungus establishes around the roots, aiding nutritional up-take and benefits plant growth and vigour. Trichoderma is known to produce antibiotic metabolites when grown in liquid culture. Inhibition of phytopathogenic fungi through antibiosis has been demonstrated. the hyphae and sclerotia of the pathogen, invading the cells and causing lysis. TRICHOTECH ® WP application recommendations vary depending on method of application and target crop. Owing to its mode of action, the product should be applied preventatively before disease onset in the plants. 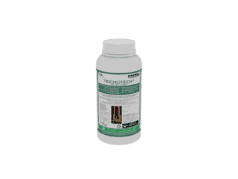 Apply 125g of TRICHOTECH ® WP per hectare. Pour in 125g of Trichotech into 100 litres of water and mix thoroughly. Apply the solution through the fertigation drip system using adequate water volume. Agitation of the mixture should continue throughout the application period to ensure uniform distribution of the TRICHOTECH ® WP. Prepare a solution of TRICHOTECH ® WP at the rate of 125g/ha in adequate water to cover the target area. Pour into a watering can or sprayer / applicator and apply evenly onto the target area. Irrigate the area treated with TRICHOTECH ® WP after application. This is recommended as a pre-transplant application for rooted plantlets or cuttings. Put them standing into perforated plastic crates and dip-to-soak soil plugs and /or roots into a solution of the product. Make a solution with 125g in adequate water to treat plants to be planted in 1 hectare. Apply pre-plant, as a seed coat or every two weeks to one month depending on the disease pressure. For use in controlling: Pythium sp., Fusarium sp., Sclerotinia sp., Rhizoctonia sp. Store TRICHOTECH ® WP in a cool dry place. May be kept for up to 6 months in original an opened container maintained at 8 - 12° C.